Rep. Les Gara on KUDO! Mudflats contributor and one of the White Knights of the Troopergate investigation, Democratic Representative Les Gara of Anchorage is going to be a guest on KUDO radio shortly! Les has been an outspoken advocate of getting the truth out there, and getting the McCain campaign and their lawyers out of our Alaskan Department of Law. Alaska politics is making strange bedfellows these days. Last week Wasilla conservative Republican, and Alaska State Senate President Lyda Green spoke with KUDO, the progressive talk radio station. Green was one of Palin’s mentors at the beginning of her career. But years went by, and the two began to disagree. There were power-plays, and barbs thrown. Palin appeared on a conservative radio program in which the DJ said he was going to say what Palin couldn’t about Green. “She’s a B**ch!” Response from Palin? Giggling. “She’s a cancer!” More giggling. And yes, Lyda Green is a cancer survivor. Eventually, Green decided that she no longer could work for the Legislature while Palin was governor. Her constituents were rabidly pro-Palin and the writing was on the wall. So Green announced she would not be running for re-election in November. This was big news when it happened, back in the day when we weren’t in the national spotlight. So Lyda Green, who was intensely disliked by the Democratic Party (although they never called her names on the air) made an I-have-nothing-to-lose appearance on KUDO. She came right out and said that the investigation should and would proceed, and that nothing had changed. We were seeking the truth when it all started, and we still are. What followed were calls of praise and admiration from the very ‘blue’ listening audience…. It was like something out of the Twilight Zone. Now from the progressive community who normally wants to see his head on a pike,there’s another uber-conservative pundit who is engendering praise – Dan Fagan. Dan Fagan is a notorious right wing radio talking head, turned columnist in the Anchorage Daily News. The ADN is frequently criticized by the vast right-wing community in Anchorage as being a “socialist rag”. So they hired Dan Fagan, and now they can say “Well, what about Dan Fagan? ?” and cross their arms. Fagan frequently talks in matter-of-fact terms about “liberal bias” in the media, and now he has a “liberal media” nest in which to comfortably perch, and continue to do just that. And anyone unfortunate enough to walk under the nest will likely have a ‘deposit’ land on their head. “Evil?” Zounds! Fagan’s been called a lot of names, but I don’t think he’s ever been called ‘evil’. And, do we infer that Palin thinks that everyone out there who believes in reproductive choice has “evil stuff going on” with them? The real damage to Palin from Troopergate comes with an injury claim involving trooper Wooten when he hurt his back while in the line of duty. Independent investigator Steve Branchflower testified recently he believes someone in the governor’s office tried to block Wooten’s workers’ compensation injury benefits. Harbor Adjustment Services, the company hired by the state to process, evaluate and decide on workers’ benefit claims, had great financial incentive in bowing to pressure from the governor to deny Wooten’s injury claim. Obviously, the state is Harbor Adjustment Services’ largest client. The owner of the company denies the governor’s office pressured her to deny Wooten’s benefits. Why wouldn’t she? Ratting out the governor could cost her the lucrative state contract. But Branchflower says an employee with Harbor Adjustment Services contradicts the owner and has testified the governor’s office did apply pressure to deny Wooten his benefits. We know the governor’s office was very interested in Wooten. Dianne Kiesel, a state employee with the Department of Administration, tells me former Palin chief of staff Mike Tibbles instructed her to walk Wooten’s personnel file over to the governor’s office. And there is the governor’s aide, Frank Bailey, caught on tape admitting he has information that came from Wooten’s workers’ comp file. The very file that includes pictures, taken by none other than Todd Palin, of Wooten riding a snowmachine trying to prove the trooper was not injured. Here’s why this is all so damaging to the governor. It’s one thing to try to get a trooper fired because you believe he is a danger to the public. But using your considerable power as governor to block the benefits of a former family member you have a long-running dispute with moves this scandal into a new realm. It becomes about one thing and one thing only, revenge. Not public good, but settling a score. Fagan is correct in that this angle on Troopergate hasn’t been explored deeply. We get hung up on tasers, and ex-wives, and affairs, and ‘rogue cops’, but the thing that may stick, is Palin’s tampering with the worker’s compensation claim. With Al Capone, it was tax evasion…you just never know. It was only a week or so ago that the unnamed employee from Harbor Adjustment Services came out with her information to investigator Stephen Branchflower’s “tip line”. And it has also only recently been revealed that part of the file includes photos of Wooten on a snowmachine, taken by Todd Palin while he was out collecting evidence to use against Wooten. Yes, at one point our “First Dude” Todd Palin was following Mike Wooten around to ‘get something’ on him. 19 days and counting until special investigator Stephen Branchflower’s report on his findings in this investigation. The Ed Schultz Show’s Town Hall Meeting in Anchorage! 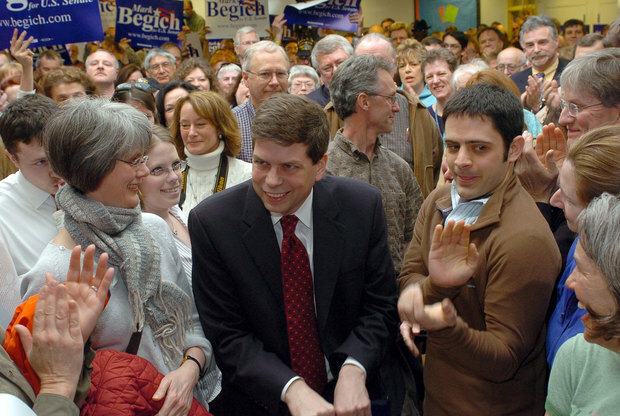 Anchorage Mayor and U.S. Senate candidat Mark Begich maked a surprise appearance. DON’T FORGET – Tune in to the Ed Schultz Show on KUDO 1080 AM, 8am-11am Alaska time, 12pm-3pm Eastern Time. Click HERE to listen in! It’s still amazing to me how the media have flocked to our fair city. One visit that I was particularly pleased with was progressive radio talk show icon Ed Schultz, bringing “Team Fargo” to the University ofAnchorage for a Town Hall meeting. Sarah Palin was the topic du jour. No need to say that was there? Nobody found us particularly interesting until this whole fiasco came up. Usually we have to resort to bribing famous people with fishing trips and tales of natural splendour. And they still don’t come. I decided to splurge and get the VIP Passes at $100 a pop. But it made me feel good to shake the man’s hand, have some finger food, and donate to a worthy cause. And I needed something to eat after attending both the Palin rally and the anti-Palin rally earlier in the day. The VIP group of about 30 people were treated to a good progressive pep rally by our illustrious host, who, in another life, wanted to be a football coach. We’ll have none of that talk now. We need him right where he is. The house wasn’t packed, but there was a respectable crowd, and everyone was more than willing to give opinions on the woman who might very well be sitting in the Oval Office some day. I’m sorry. I know that felt as strange to read as it did to write…but that’s what we’re dealing with. Bottom Line: Do Alaskans think she’s prepared? No. You can tune in to Ed’s Show to hear all about her stances on women’s issues, foreign policy, wildlife, the environment, her track record as mayor of Wasilla, special ed, family matters and troopergate. Rep. Les Gara who posted here on that last issue, gave a good recounting of his feelings about the McCain people running roughshod over a bipartisan investigation, and slandering some really well-respected public servants in the process. The crowd got a little frustrated when he refused to talk about the possibility of impeachment, but that word can’t be bandied around without bringing down the wrath of the Republican ticket and it’s squadron of lawyers and spin-meisters. Click HERE for the Ed Schultz Show website. And thanks to KUDO 1080, Alaska’s progressive talk station for making it happen. Breaking Stories on KUDO Radio. Looks like it’s going to be another good day to tune in to the live feed from KUDO radio, here in Anchorage. The show Cutting Edge, with host CC will air from 3-6pm Alaska Time. That’s one hour earlier than PST, four hours earlier than EST. Today, they’ll be dishing some good dirt. On the show, Representative Les Gara is goint to talk about how “McCain’s people are coming after Senator Hollis French“. French is the legislator who is heading up the ongoing Palin ethics investigation. Republican representative John Coghill said in a letter to the chairman of the Alaska Legislative Council that comments made by Hollis French concerning Palin and the “troopergate” probe were political. Coghill, a preacher who is a staunch supporter of Palin, said French’s comments that the inquiry into Palin’s dismissal of Alaska’s public safety commissioner could form an “October surprise” indicated he was not neutral. Also in the show, John Cyr, the Executive Director of Public Safety Employees (PSEA) will talk about the ethics complaint that was recently filed against Palin by the union, alleging improper use of information from the personnel file of Alaska State Trooper, Mike Wooten – the ‘trooper’ in ‘Troopergate’. They love hearing from out of state callers, so feel free to call in and ask questions, or share your views, even if you’re not from Alaska.